This past weekend, I splurged and bought a few packs of berries (a special treat indeed, considering the snow still falls in the mountains) because I was so inspired by a new recipe: fermented berries. We tend to rely on our fermented vegetables like sour pickles and hot pink jalapeno garlic kraut, as well as tonics like beet kvass, Cinnamon Spice Kombucha, and Jun tea. Just when I thought I had fermented nearly everything under the sun, I came across the idea of fermented berries. It seemed almost sacrilege at first, to take a beautiful sweet-tart and ripe berry, lovely in its own right, and to ferment it. Would I ruin them? Would my son make a face if he tried them? No, we loved them. Fermentation is a near magical process, one that transforms food. My kitchen is filled with little (and big) jars filled with fruits, vegetables and grains in varying stage of fermentation: bubbling sourdough starter, sparkling honey-sweet Jun tea, robust homemade sauerkraut, yogurt and sour cream. The recipe seemed simple enough: berries, a sweetener, water and a starter culture to help kickstart the fermentation process. In the end, they form a delightfully tart and faintly effervescent treat. As with other ferments, you’ll want to take care that the berries remain fully submerged in liquid, lest they mold. While big crocks come with huge weights, you probably don’t plan to ferment gallons of berries at a time (oh the expense! ), and instead, like me, you’ll use a pint-sized glass jar with a tight-fitting lid. Having a few fermentation weights (like these) handy can help to make sure that the berries remain submerged, and are, therefore, less prone to contamination by stray microbes. In the end, they form a delightfully tart and faintly effervescent treat. Other options include a sterilized stone, or a lid that happens to fit inside your jar, wedging down the berries. Most of the fermentation projects I undertake in my kitchen are wild ferments; that is, they rely only on the wild bacteria and microorganisms that surround us all the time. That is how I make my homemade sauerkrauts, my fermented lemons, my pickled green tomatoes. Yet, for some ferments, a starter culture can be particularly helpful. When I expect to ferment something for a short period of time, like fruit chutneys, berries, or condiments, I almost always use a starter culture to kickstart the process. I typically use a commercial starter culture (available here), but you can also use fresh whey drawn off from yogurt, a bit of brine from other fermented vegetables, kombucha or water kefir. I tend to avoid kombucha and water kefir as starter cultures as, in my experience, they can produce a slimy texture from time to time. Yes, honey is antimicrobial because it has a low water content. When that water content increases, perhaps because you’ve mixed honey with water or whey, then honey ferments just fine. That’s how we get traditional honey wines like Mead and Ethiopian T’ej. The addition of a sweetener in this recipe for fermented berries helps, like the starter, culture to speed up fermentation by providing a source of carbohydrates for the beneficial bacteria you’re hoping to cultivate. The sugars that remain after fermentation give the berries a wonderful sweetness to balance their tartness. 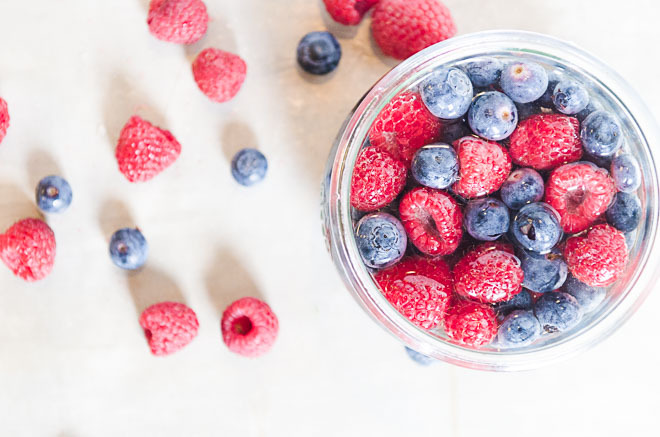 Unlike cabbage and root vegetables which typically benefit for a very long period of fermentation, berries benefit from a very short fermentation, only one to two days. This keeps their inherent sweetness a little bit better intact, and helps you to catch them before they turn alcoholic. After about a day, you’ll notice little bubbles appearing at the surface of the jar. Open the jar, spoon out a berry and taste it. Does it taste tart and faintly effervescent? Good. Your berries are done. Now, place the lid over your jar, tuck it in the fridge, and use the berries within a month. Raspberries and blackberries soften during fermentation, transforming into a thin and slightly jammy texture while blueberries puff a bit. You can puree them together in a blender, until smooth, using them as a berry sauce over homemade honey custard, yogurt or ice cream, like we do, or drop them whole into your blender for your morning smoothie. I plan to stir some of the puree into a bottle full of Jun tea to make a berry soda that I think will be positively lovely. With a lovely tartness and a beautiful effervescent sparkle, fermented berries are simple and quick to make. Serve them over custard, yogurt or ice cream, or tuck them into the blender for your morning smoothie. This recipe is reprinted by permission from The Oh Lardy! Guide to Fermenting Fruits and Vegetables. Put the berries in a pint-size jar. Pack them tightly with your clean hand or a wooden spoon. In a bowl, mix culture starter or whey, a few tablespoons of water, sugar, and salt. Pour the liquid ingredients over the berries, and then fill jar with filtered water, leaving 1½ inches of headspace. Press down with fist or wooden spoon to be sure the water has filled all the air pockets. Add more water if necessary. Be sure the berries are below the waterline, using a weight (like these ones) if necessary. Put lid on and leave at room temperature for 1-2 days. Store in refrigerator and use within 1-2 months. Could I use frozen berries for this? I haven’t tried it, but you could give it a whirl and let us know. I have been using frozen berries for a year now, works great. I do not add extra water. I have used frozen blueberries with no problem. The other fruit to ferment which is magical are bananas. Sounds interesting. How do you ferment bananas? Fill a quart jar with RIPE banana slices. Cover with whey (I get mine from straining yogurt). Add a tablespoon of raw sugar and a pinch of salt. Cover with plastic wrap and a rubber band to relieve any pressure. (Or if using the jar’s lid, loosen it a bit daily, then re-tighten. ) Put in a cupboard and check daily, till it starts to bubble. Then move it to the fridge. PS: I used this exact recipe to ferment ripe peaches- excellent! I’m doing pears and cherries next. I would have to use frozen as well as fresh is just too pricy for me these days. My friend from church keeps telling me that nutritionally, fermented foods are much better for you? I have no idea if this is true or not but she ferments everything! I’m so new to this so I am a little intimidated but still eager to try. When you purée to make a berry sauce, would you puree with the fermentation liquid? Yes, definitely. It makes it a little thin, but it’s a lovely sauce. I have been very intimidated to try my own fermenting. I think this is a great place to begin. Thanks. I never considered that one would or could ferment berries. In reading the recipe I like that one can use fresh whey for the culture – since I have recently started making yogurt, I have whey on hand. Sounds like an easy way to start with fermenting. You can ferment any fruit, except strawberries. While strawberries WILL eventually ferment, they are likely to get moldy first. Their acid slows down the fermentation process. I’ve been wondering about wild fermentation vs. anaerobic fermentation using special jars and lids that keep out oxygen. I have heard that wild fermentation (the kind I’ve always done) is actually harmful, while anaerobic fermentation is what creates the prized good bacteria. Is love to hear your thoughts on this. Before you try any anaerobic fermentation, please read up on c. Botulinum which is an anaerobic bacteria. I would not try anaerobic fermentation unless you are heat processing your ingredients first then adding a fermentation starter in sterilized containers. Sharon, with respect, I don’t think you fully understand fermentation or heat processing and botulism. Botulism cannot live in an acidic environment, which is why properly fermented foods are not at risk of being a source of botulism. Heat processing will only serve to kill the beneficial bacteria, since botulism can’t be present. In alkaline foods (not acidic), botulism can thrive provided those alkaline foods are in an anaerobic environment, but heat processing won’t do anything because botulism can survive the heat required in water bath (heat processed) canning. Non acidic foods should be pressure canned to kill off botulism. Can’t wait to try this! If I were to use brine from another ferment, would I use the same amount as I would if I were using whey? I recently got into a discussion on another site about the use of honey in the 2nd ferment of milk kefir. Basically the gist of the discussion was not to use honey because its anti-bacterial and will “kill the kefir”….! I use a small amount of raw honey along with fruit of some type in my 2nd ferment of milk kefir. This is for taste mostly, but with all the wonderful properties of raw honey, I was hoping that the synergistic effect of probiotics and enzymes from both would be beneficial! Lots of people on the thread discussion were bummed because one of the commenters said the above. My research did not lead me to the conclusion that honey would “kill the kefir” and I kept asking for a source or reference for that info but never got it. Would love to have your thoughts!! Thanks! Oh how I hate fermentation myths! No, there is no evidence that honey will kill the kefir. I wouldn’t put it in the first ferment, but in the second ferment is fine. For the life of me I hate sauerkraut and I have also learned I will not learn to enjoy it. 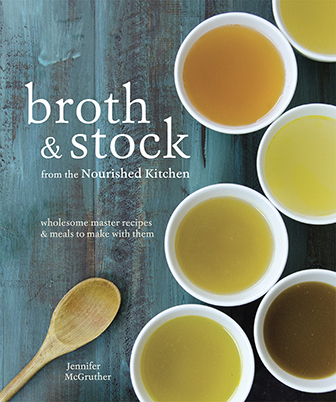 So I am so excited to hear about this – I am going to make this, this weekend!!! Jenny, I love fermented foods and would love to learn how. I have noticed you use whey, in which I am allergic, is there another substitute? Could I use the liquid from another ferment like saurkraut or kombucha? Could any of the culture starters be used for this or which one would be best? I suggest you up your fermentation METHOD WITH THE PICKL-IT JARS. Kathleen is a fermentation and food GENIUS…SHE INVENTED THEM. I have the full line and ferment the WORKS! I did. She sent some to me, then I bought 6 of them because I liked them so much. Then their seals degraded with time, and I recycled them all. I would not purchase them again. I have purchased replacement seals for the pickle it jars (fido jar seals) very cheaply, which solved this problem! Thank you for sharing this! I made some last weekend and finished them within a few days. What can I do with the leftover liquid? We grow berries, but I haven’t thought about fermenting them. If the harvest is large enough this season (we had too few chill hours to hope for much), I will give it a try! Thanks for the idea. If you ferment vegetables using a starter and then use some brine from that batch to ferment the next batch, would you maintain the integrity of the starter probiotics in the next batch?? I’m really excited by this recipe, though the thought of using factory-made culture doesn’t really appeal to me. Is there a way to ferment the berries according to wild fermentation instead? Thanks for this great idea! I am going to try it with frozen berries. I have been fermenting veggies for a few years now but have not tried much else. 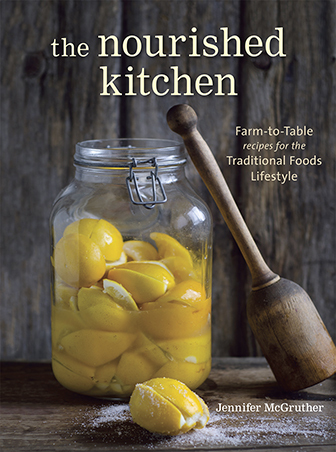 After reading this I am beginning to wonder if I let my fermented veggies sit out long enough. the most I let them sit out is a week, but I often put them in the fridge after 4-5 days. Is that enough time? I get nervous to leave the sauerkraut out too long because it starts to rise above the water. Any help would be greatly appreciated!! What do you think about using ginger bug as a starter for this? My only concern would be that my ginger bug is an aerobic culture. The fruit then would also need to culture aerobically. Can you ferment black beans? I left some on the counter soaking too long… Wondering if I can still use them to ferment? Can I use raw ACV with the mother as a starter? No. Raw ACV does not make a good starter culture. I tried this a few weeks ago using sauerkraut brine and it was great! Very fizzy and tart, but good, after the 2 days, I kept some pieces to see if it would be alcoholic, and it did taste like it was heading there. The cool/ weird part was that the raspberries turned white! I think the blackberries changed color too. I always use frozen. Fresh would probably keep their crunch a little better, but frozen berries are so much cheaper. Strawberries def become mushy, but frozen blueberries can hold up pretty well. If I wanted to make 1 quart, would I just double the ingredients? I made a quart in which I doubled everything except the sugar and salt. I am not sure if this was correct. Yo can try and let us know how it goes. The fitst batch, in which I doubled everything except sugar and salt, came out very good. I had a second batch in which I doubled everything except the sugar, but it tastes a bit too salty. That’s really good feedback, Don! Thanks for the follow up. Can I ferment just strawberries using this method? They don’t do particularly well, but you could try and see how you like it. Can I use a probiotic capsule as a starter culture? If so about how much bacteria in one capsule should I use and are there any specific brands that people have used in the past. Thank you! This is just what i was looking for: can i use these fermented berries to make a shrub by adding brags ACV ? Dying to try to ferment berry shrubs. Is the whey acid as from yogurt making or sweet from cheese making? It should be from yogurt with live and active cultures. I have some blueberries I picked last summer that I had to thaw out to make room in the freezer for a hog we had butchered. These berries were not washed prior to freezing. I’m wanting to ferment these (2 cups), but have no whey or other starter. I do have honey from my hive, etc. So wouldn’t the natural “powder” that is on these be enough to start the fermentation, with the help of the rest of your recipe sans the starter? Can the liquid be used repeatedly to ferment berries in? If so, how many times? I have Cutting Edge Culture which says that each packet ferments 5lbs of vegetables. This recipe calls for 1/2 tsp starter culture, which was an entire packet, for only 2 cups of blueberries… So I was hoping I could reuse the liquid multiple times to get the most out of it. Your ingredient list mentions honey but your directions say water…. is it the same measurements for both?